Oliver Sava: After months of teasing and a couple weeks of shipping delays, Wolverine is finally dead. Will he be back? More likely than not. 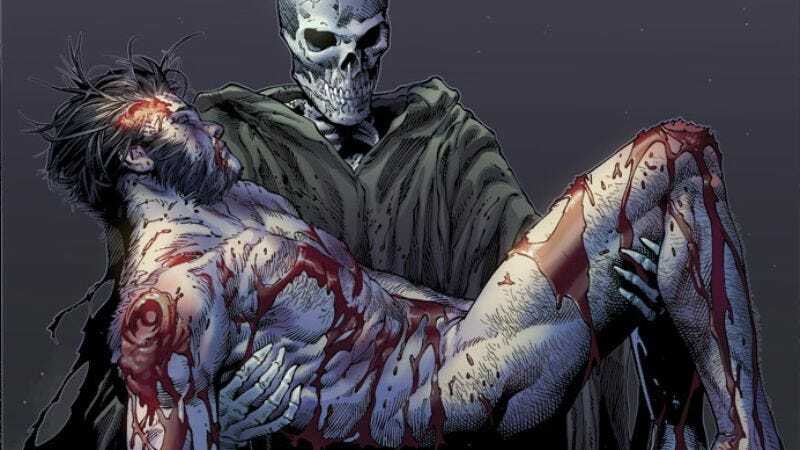 But assuming this really is the end for one of Marvel’s most famous superheroes, how does the Death Of Wolverine hold up as the conclusion of a character arc? Pretty damn well. After all the hype—and make no mistake, Marvel’s hype machine was running at full power for this event—the miniseries succeeds by keeping the story relatively contained, focusing on a few key aspects of the hero rather than overextending its scope. The miniseries doesn’t have the strongest start, with the first issue setting up a plot that feels highly conventional for a superhero comic: Someone has put a bounty on Wolverine and now he’s being hunted by enemies old and new. The use of super-soldier Nuke as the villain of that opening chapter would make more sense if the story drew some sort of connection between Nuke and Wolverine’s shared history as experiments of the Weapon Plus program, but the character is presented as a stereotypical domestic beer and fried food-loving American whose main purpose is to be used as a punching bag for Wolverine’s adamantium skull. So in the first issue of a miniseries that is specifically about a character getting killed off, a different character is revived without any explanation and we’re just supposed to accept that as comic readers? If you’ve read that Rick Remender Captain America story, seeing Nuke alive immediately pulls you out of the story, and it’s hard to believe that Marvel editorial will really commit to Wolverine’s death when that story begins with the revival of a character that died just a few months ago. Nuke is a small part of the story, but when it’s a heavily publicized event like this, Marvel should really demand that the editors be on top of everything. While the story steadily improves with each issue, the miniseries does feel like a parade of familiar Wolverine-related characters and concepts until the final chapter, which finds a lot of depth by pitting Wolverine against the man who created him. 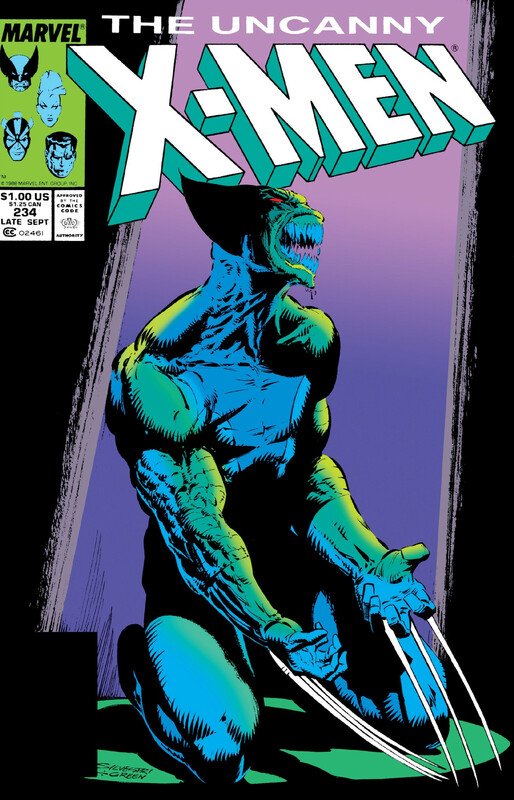 The second issue puts Wolverine in Madripoor where he encounters foes like Viper, Sabretooth, and Lady Deathstrike, losing an eye in the process and becoming more like his classic Madripoor alter ego Patch. Issue #3 takes him to Japan, where he bonds with Kitty and fights psychic ninja Ogun, and in the finale he visits a Weapon X-like facility in Nevada because Soule can’t use the real Canadian Weapon X facility, which is currently the base of operations for Cyclops’ team of X-Men. It’s fun to see Wolverine make his way out of deadly situations without the help of his healing factor, and artist Steve McNiven draws some grisly fight sequences in this miniseries, but the story doesn’t click until the final chapter. It’s an inspired choice to have the big bad of the piece be Abraham Cornelius, the Weapon X scientist that discovered how to bond adamantium to Wolverine’s skeleton all those years ago, and ultimately Wolverine sacrifices himself so that he can prevent the creation of new weapons like him. Tying the character’s end into his beginning brings a nice symmetry to Wolverine’s story, and along the way, Soule explores the core qualities that make Wolverine more than just the killing machine he was designed to be. Tim, how did the actual moment of Wolverine’s death resonate with you? Did you feel that the creative team built to a satisfying conclusion? And was there anything you felt was missing from the miniseries? Tim O’Neil: My first reaction after finishing the story wasn’t actually about Wolverine at all. My first reaction was the realization that DC has no idea what they’re losing with Charles Soule when he goes exclusive with Marvel in a few months. Soule’s triumph here is not that Death Of Wolverine is an instant classic—while it has its moments, it doesn’t really cohere until the last act. The triumph is simply that the story is readable in the first place, considering the circumstances of its creation. That the story being told here is not the story that Marvel had initially planned to tell is a matter of public record. The events of Death Of Wolverine proceed naturally from Paul Cornell’s recent run on the character’s solo book: Logan has lost his healing factor, as a result of a conscious decision made in order to save the world from an invasion of parasites from the Microverse. This change has been reflected across the line for months, affecting Wolverine’s status as an X-Man and an Avenger, as well as putting a serious crimp on his solo adventures. Whatever Marvel’s remit at the outset of the process, the book still reads very much like a Charles Soule book. I’ve been trying for a while to articulate precisely what it is that makes a Soule book read like a Soule book; for such an immediately popular and acclaimed writer, he almost seems to have appeared fully formed without the benefit of a recognizable style in the same way that, say, Brian Michael Bendis, Jonathan Hickman, and Geoff Johns are all instantly recognizable writers regardless of their collaborators. The best I can figure out so far is that Soule’s books all share a sense of sturdy plausibility in terms of cause and effect for both plot and character beats. I know this sounds both boring and even a little obvious on first examination. But the guiding line through all his diverse mainstream work to date, from She-Hulk and Thunderbolts at Marvel, through to Swamp Thing and Red Lanterns at DC and his creator-owned Letter 44, has been his willingness to sit down and rationally think through the natural consequences of every premise he’s given, and to play out the consequences of each story with a commendable attention to character detail and continuity. His books feel well constructed and satisfying in a way that completely belies the crushing amount of work he’s actually producing. He was able, along with Greg Pak, to make something genuinely interesting and compelling out of as unpromising a premise as DC’s recent “Doomed” crossover. He’s got the goods. It could have been a different story if they had wanted to turn it into an X-Men epic—dying in the arms of Kitty Pryde, Jubilee, and Armor after sacrificing himself to save the world from the latest nefarious scheme of some preposterously armored arch-foe. But the story they chose to tell was a story about Wolverine the solo adventurer, facing a handful of menaces with personal resonance before finally returning to face his death at the place where it all began, Weapon X. He doesn’t die saving the world, he dies saving a handful of total strangers from having to undergo the same torture that created him. It’s a brutal, painful, and lonely demise, and for that reason I think it works a lot better for the character than any cosmic slugfest ever could. OS: That’s a great way of summarizing Soule’s appeal as a writer. I’d also add that he’s keenly aware of the qualities that make established properties distinct. Alan Moore made Swamp Thing more popular than ever by combining intimate horror stories with sprawling mythology, and Soule has been taking that same approach on his run. Red Lanterns is a cosmic exploration of rage and violence, so Soule put Guy Gardner, a noted hothead with a significant fan base, in the lead role to bring new life to one of DC’s more forgettable New 52 series. She-Hulk is a superhero law comic, and Soule’s experience as a practicing attorney has given him the tools to really dig deep into the book’s legal drama. You mention Soule pinch-hitting on this miniseries, which is especially notable because this is the second time Soule has found himself in this position at Marvel in 2014. After Matt Fraction left Inhuman at the end of last year, Soule was brought on to take the book in a direction more aligned with what Marvel editorial wanted, and he’s done strong work building up the new Inhuman status quo in the ongoing series. Unfortunately, Inhuman took a big hit in the form of delays; the first issue was moved from January to April to accommodate the writer switch, and the slow speed of artist Joe Madureira resulted in considerable waits between the first three issues. Delays are bad enough, but when they happen to event comics that are supposed to have a far reach across an entire publishing line, they are even more damaging. When Marvel announced that Steve McNiven would be providing the art for a weekly miniseries, I was immediately skeptical. McNiven is an exceptional artist, but he’s not great with deadlines, and almost every Marvel project he’s worked on has suffered delays or required a fill-in artist to give him extra time. While I don’t know the specifics of why Death Of Wolverine was delayed, it’s safe to assume that it was art related. The delays were just a few weeks, but when it’s a high-profile event comic that has been solicited for weekly release, Marvel should really want to stay on that schedule or momentum will quickly dissipate. Readers are expecting a new issue every week because that’s what the publisher promised, and when a week comes around with no issue, interest starts to dip. And then there’s the price point. Each issue of Death Of Wolverine is $4.99 for about 20 pages of story plus behind-the-scenes material looking at the creative team’s process, which makes the entire miniseries a $20 investment for less than 100 pages of story that can easily be read in a half hour. Readers can stretch that reading time by devoting more attention to the slick artwork by McNiven, inker Jay Leisten, and colorist Justin Ponsor, but there’s no denying that this is a very fast read. That’s part of the story’s appeal; it moves quickly and doesn’t give Logan any breaks to catch his breath, working him to a point where he’s running on empty. But fans expect to get more meat from a $4.99 single issue, and padding the page count with extras that have their appeal but really belong as bonus features in the inevitable collection is a shady move. Tim, what are your feelings about the way Marvel has approached the release of this book? Did the delays impact your interest? And what are your feelings on Steve McNiven? He’s an artist I’ve been following since his early days at CrossGen, and I feel like this miniseries really shows off his strengths as a draftsman and action choreographer. I was especially impressed by moments like Wolverine’s fight with Viper’s henchman, which is depicted with a strict 12-panel grid that is a lot less flashy than McNiven’s usual work, but no less effective. What were some of your favorite visual moments of the miniseries? TO: Hey, man, Red Lanterns was always one of my favorites of the New 52 books, even before Soule took charge. The key was that Peter Milligan always intended it to be read with tongue firmly in cheek, sort of like a roided-out WWE locker room feud laid out in a monthly comic book. Go back to the Milligan run and read it with some Iron Maiden in the background. The delays didn’t bother me at all. I should put an asterisk next to that, though, by adding that I don’t usually pay much attention to things like that. I’m not plugged in to such an extent that I really care if most books ship late. I read so much that a late book doesn’t register that much unless it starts to stretch out to Daredevil: The Target proportions. Despite its moments, Death Of Wolverine wasn’t great enough to make sme gnash my teeth and rend my garments that the book was a couple weeks tardy. With that said, everything you say about McNiven is correct. Civil War was (I think?) Marvel’s biggest sales success of the last decade (feel free to correct me in the comments), and its late shipping impacted the whole line. I think it’s fair to say that Civil War was probably a more challenging artistic assignment—dozens of marquee characters per issue, versus three or four. McNiven’s work looks a lot looser here, with less in the way of the microscopic details that made Civil War such an interesting read (visually, at least), and, as you correctly point out, more attention is paid here to the business of precise choreography. It’s less worried-over than Civil War, which looked downright fussy in places, and that probably explains how the book was able to even come close to a weekly schedule. It goes without saying that the story is slight enough that, had the book been monthly, fan reaction would be far less positive than it has so far been. If you’re going to give me a book I can read in five minutes, at least have the decency to put it out at a fair clip. Almost every artist who climbed aboard the doomed ship CrossGen improved as a result. Mark Alessi was by most reports a nut, but he had a few good ideas, and one of those good ideas was making artists work an eight-hour day at the drawing board, every day. The results, in terms of the post-CrossGen careers of people like Jim Cheung, Aaron Lopresti, Paul Pelletier, and McNiven, speak for themselves. He can be flashy when he wants to be, but he’s got a solid enough grasp of fundamentals to push through fairly ambitious compositions. This book will undoubtedly sell well in collection for some time to come (The Death Of Superman still sells, and Big Blue’s been back for a while now), and McNiven certainly deserves the royalties. For me, the strongest issue was the fourth. Maybe because it was the simplest issue in terms of the number of characters and settings, it allowed McNiven to focus more on what really matters: Logan getting the tar beaten out of him for 20 pages. The final confrontation with Cornelius, where he cuts his palm and presses it flat against the window, was a great scene. We already knew the stakes, had known the stakes for months in advance, but here was one last reminder that Wolverine wasn’t what he used to be. I’m honestly curious to see what the sales on this series are going to be—not that we ever get exact numbers, but the relative amounts should be interesting. Are we talking big sales or blowout sales? The first two issues topped the charts on the same month that DC did its annual gimmick cover month for Futures End, and it should come as no surprise that it did so, especially given the preponderance of alternate covers. According to the gallery in the back of issue #4, there were 10 incentive covers for the first issue alone, which means that regular McNiven-covered issues are probably going to be a staple of 50-cent boxes for years to come. My gut feeling, though, situated as I am just slightly apart from the daily travails of the Wednesday crowd, is that this wasn’t as big as it could have been. They made a conscious decision to keep the “event” really small, which is remarkable considering the fact that if they had wanted to go that route they could have slapped a Death Of Wolverine logo on half the line for September and gotten away with it. Obviously that’s going to change—has already changed—as the news of his death spreads in-story to the rest of the Marvel Universe, but considering just how crazy the event could have been, this has been positively restrained in comparison.